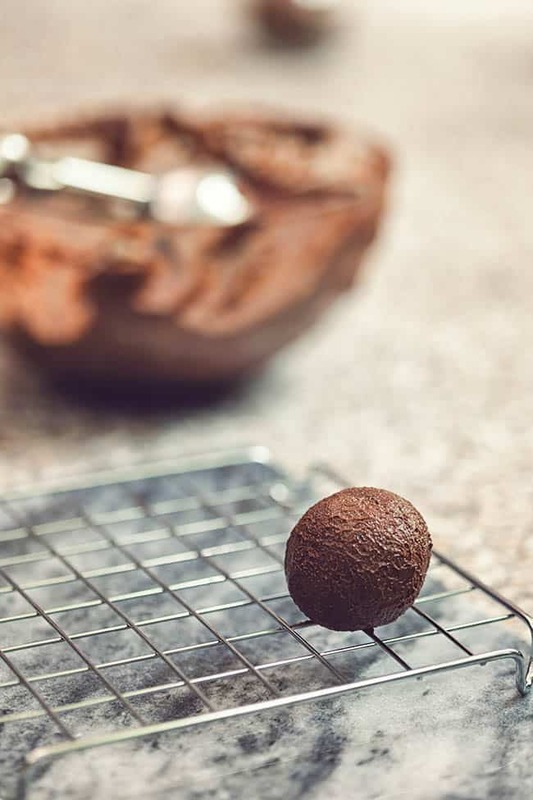 Keto Chocolate Truffles are silky smooth, rich and so simple to make – the perfect low carb chocolate dessert. Made with only 5 ingredients and are sugar free, gluten free, vegan and paleo friendly. With Valentine’s Day just around the corner, surprise your sweetie with a batch of fat bombs, brownies or some homemade chocolate truffles. CAN YOU HAVE CHOCOLATE ON KETO? Yes! Depending on your macros and what your personal goals / limits are – you can certainly enjoy desserts and chocolate while following a ketogenic lifestyle and the great thing is there are lots of keto desserts you can find online these days. 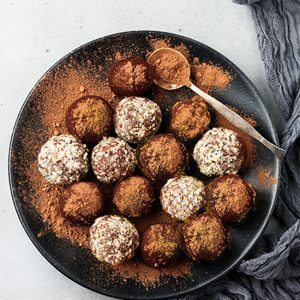 These Keto Chocolate Truffles call for just a handful of ingredients and are quick and easy to prepare. 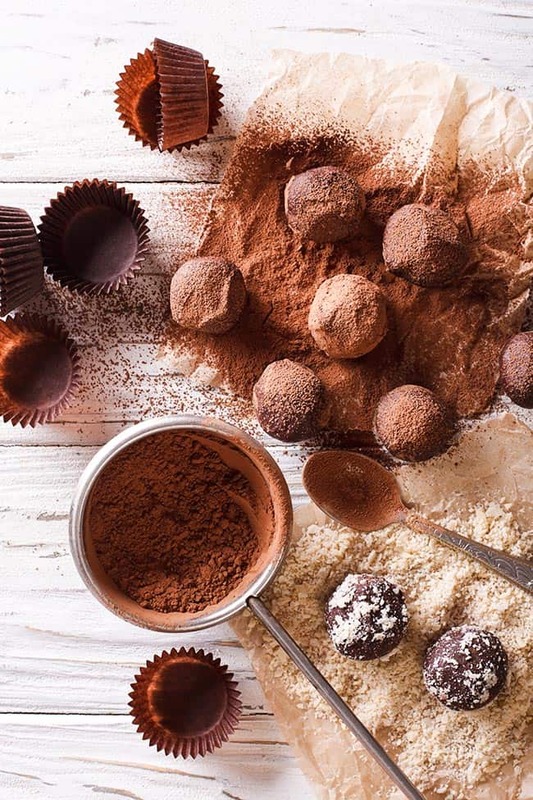 Plus you can customize these sugar -free truffles with your favorite ingredients and toppings you have in your pantry. It’s the perfect easy base recipe to start off with. 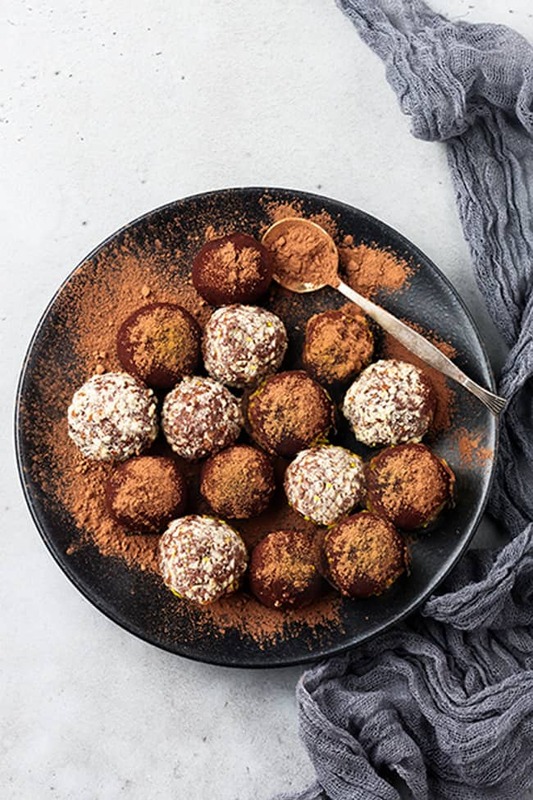 You can roll these healthy chocolate truffles in more melted chocolate or add some chopped up nuts or berries to make them even more indulgent! 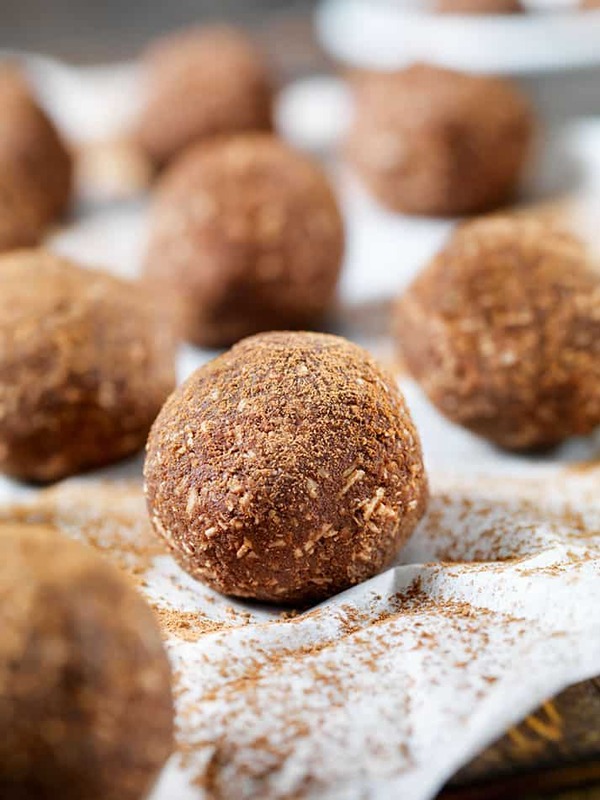 These paleo chocolate truffles will not only help satisfy that chocolate craving without the guilt, but they are sure to impress your loved ones over any store-bought confections. CHOP THE CHOCOLATE: Finely chop chocolate and place into a large heat resistant glass bowl. HEAT THE CREAM: Place the coconut cream and monk fruit into a small pot and heat over medium heat until small bubbles form around the sides of the pot and the cream is steamy, but not boiling. Whisk until monk fruit is dissolved. 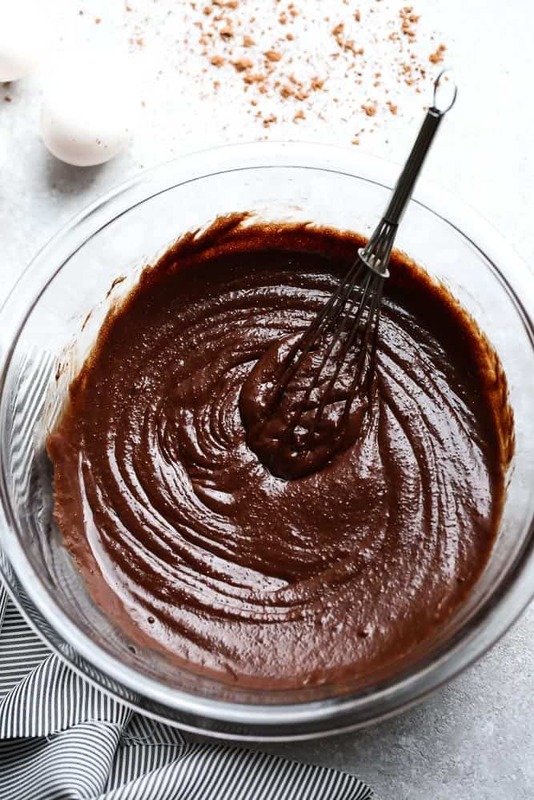 MELT THE CHOCOLATE: Remove pot from heat and pour cream mixture over the chocolate and let sit undisturbed for 4 minutes. Stir gently with a whisk until smooth and fully incorporated. Add the vanilla and salt and stir. COOL: Let cool then cover and refrigerate several hours until firm or over night. PREPARE THE TOPPINGS: Pour toppings out on to separate plates for rolling the truffles. ROLL THE TRUFFLES: Remove the mixture from the fridge and lay out a waxed paper on your work surface. Scoop chocolate ganache from bowl with a melon baller or small cookie scoop and roll each portion of ganache into round truffles. Drop into your toppings and roll to cover the entire surface and then place onto a separate plate. Repeat until all truffles are complete. Store in airtight container in the fridge prior up to 4 days. Finely chop chocolate and place into a large heat resistant glass bowl. Place the coconut cream and monk fruit into a small pot and heat over medium heat until small bubbles form around the sides of the pot and the cream is steamy but not boiling. Whisk until monk fruit is dissolved. Pour cream mixture over the chocolate and let sit undisturbed for 4 minutes. Stir gently with a whisk until smooth and fully incorporated. Add the vanilla and salt and stir. Let cool then cover and refrigerate several hours until firm or over night. Pour toppings out on to separate plates for rolling the truffles. Remove the mixture from the fridge and lay out a waxed paper on your work surface. Scoop chocolate ganache from bowl with a melon baller or small cookie scoop and roll each portion of ganache into round truffles.